I like to do my Christmas shopping before heading home for the holidays. The selection is pretty limited where I’m from, so I try to get things that are a little different than whatever the local Wal-Mart might have. I also really like to have everything wrapped and ready to go because I love seeing the excitement on my nephew’s face as we unload the presents and put them under the tree. I hope it’s at least a fraction of the thrill I felt each year when Grandma brought out her presents. This year, I’m not decorating my own home for Christmas. I might just eat some of those Hershey’s candy cane kisses and call it a day. In general, I’m not much of a homemaker. I think that’s mostly because I’ve never had much of a home. In the past two years, I found that I really loved putting up Christmas lights, threading popcorn on a string, and decorating a little tree, but that was because I was sharing it with someone. As it turns out, ritual is better when you have someone to share it with. Which brings me to my point, which is that for me, sharing rituals is the most intimate and humiliating part of relationships. Nothing feels better than reaching a point where participating in ritual with someone feels safe. But later, when the relationship is over, I always feel deep humiliation about the whole thing. I think it’s because my rituals are sacred to me. My family home, and returning there throughout the year, is sacred to me. There is land and space and wonderful people who listen when you talk. There is peace and quiet to read books and have long conversations that last all morning. It’s a privilege to be able to spend time there, and it’s something I hold sacred and private. And, it’s all very humiliating when someone sees the ritual and experiences it for a little while, and then chooses something else. Oh, God. Nothing’s worse. This entry was posted in family, life, love, relationships, travel and tagged christmas, decorating, holidays, presents, ritual, shopping on December 18, 2014 by sherewin. I never used to be the person who said this, but I am now: the holidays are hard. I want to be home with my immediate family, but I also want to be here, in my own home. I want to cook. I want to write. I want the warm fuzzies of the holidays. I have very high expectations because holidays past have almost always been really wonderful. I wasn’t able to/chose not to go home to Oregon, and that was hard. But, I also got to have two Thanksgiving dinners–one with my boo’s family and one with my Utah family here. It was really nice to be with these wonderful people who I’ve come to know and love. Christmas lights are up outside and this little tree is up for the second year in a row. 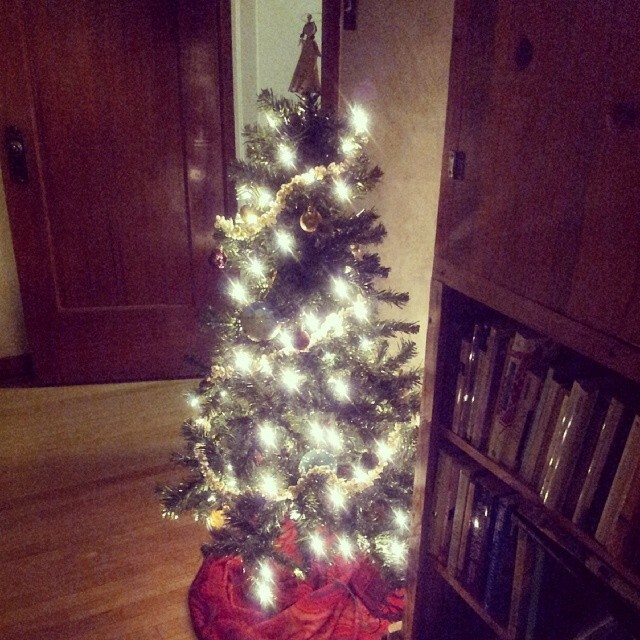 I put a rebozo down for the tree skirt. I used to be completely against fake trees, but my mom convinced me otherwise. I can keep it up for longer, without it drying out and getting one in the city is a huge pain in the rear. Still, nothing beats the smell of fresh pine! Last year was the first year that I had my own Christmas tree. Each year I do a little more to make my home festive for the holidays. Normally, I would just wait until I went to Oregon and then bake and decorate like crazy the entire time I was there. Now, things have changed. I’ve changed, my family dynamic has changed, and I have a stronger desire to develop my own rituals and traditions in my own home. Part of this has to do with having someone to share the holidays with. But mostly, probably, it has to do with the fact that I am no longer a student (as I had been for my entire adult life) and can now afford to do a few simple things–like buy and string up Christmas lights, which I love! Still, I miss my family in Oregon, and I can’t wait to see them at Christmas. Just a few more weeks of work and whole lot of grading, and I’ll be ready to go. This entry was posted in life, love, relationships and tagged Christmas tree, decorating, family, holidays, Thanksgiving on November 30, 2013 by sherewin.